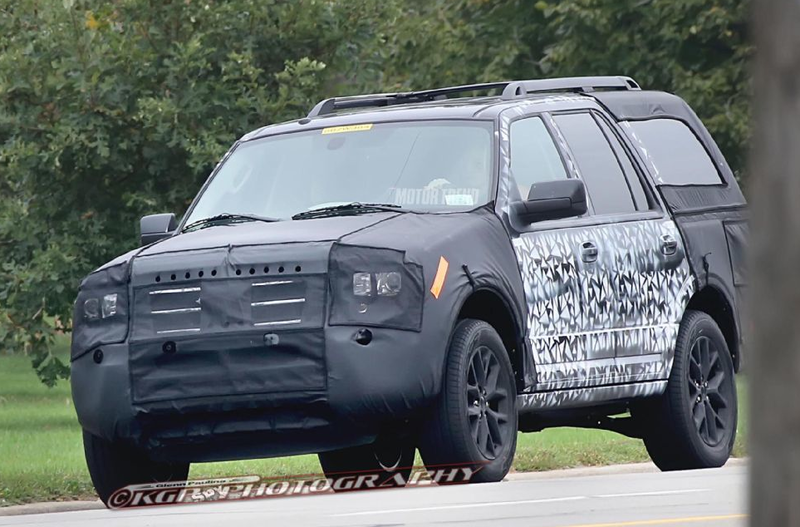 BRIGHTON, Mich. - Spy photographers have recently gotten a sneak peek at the 2015 Ford Expedition, as the camouflaged car was seen out and about in southeast Michigan. Although it was covered pretty well, it does seem that the SUV has undergone a few changes. When comparing the current SUV to the prototype out on the road, it appears that the vehicle will be getting a more upright front fascia and a taller, wider grille. In fact, the SUV seems to have taken some styling tips from the Ford F-150, and Ford F-Series Super Duty trucks in the face department. It's rear end also looks to have received an update, with a straight exhaust replacing the current angled one. The 2015 Ford Expedition is expected to receive some under-the-hood updates as well, as fans have predicted that the new SUV will replace its current 310HP, 5.4-liter V8 engine with a 3.5-liter twin-turbo EcoBoost V6! The EcoBoost would increase the horsepower to 365, while improving the current EPA ratings. As for inside the vehicle, it appears that the center stack has been modernized, but with knobs and buttons instead of the touch-sensitive controls. This model looks to be getting some storage space on the top of the dash, with huge silver-finished panels lining the center stack. The steering wheel will also be updated to accommodate the new design. An engine stop-start system is visible, promising drivers that the 2015 Expedition may offer hands-free keyless entry. It will still be a few months before the finished product will be revealed, however, we hope this sneak peak at the 2015 Ford Expedition will suffice for now! If you'd like to check out the current model, stop by our dealership! We are proud to carry a variety of SUVs, Crossovers, New Ford Cars and New Ford Trucks. So come on by and let us set you up with a test drive, or sit down with our financial experts and discuss everything from Auto Loans to Used Car Value.